I had an experience I still get giddy about. I was working on one of my radio controlled airplanes in the hanger when by wife and daughter started yelling for me, in a good way, to get up stars. I was so excited I still had my transmitter which I use to fly the planes in my hand. So when I go out to our front yard I see a shape that for me was easy to recognize, a 1951 Hudson Hornet. The owner was friends of our neighbor Jim and was visiting. For those of you who are not that familiar with the Hudson, it was THE car in NASCAR racing in the 50’s. The Fabulous Hudson Hornet was a famous racer in the NASCAR Grand National series which is now the Sprint Cup Series and AAA stock car produced by the Hudson Motor Car Company. 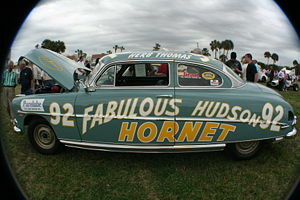 Marshall Teague and Herb Thomas each drove in a Hudson Hornet that they nicknamed the “Fabulous Hudson Hornet”. More recently Disney made it a start in their movie Cars using the voice of the late Paul Newman. So the owner, Gene, tells me the story which you will see in the video I shot with my iPhone. I always carry that thing. We hop in the car while he lets my neighbor Jim drive it. I was in the back seat which was HUGE and comfy. I was happy to end the story then but Gene asks me if I want to drive it. Well yeah!!!!!!!! This car handled quite a bit different than today’s cars. I weights 3,200 pounds and with drum brakes took a while to stop or just slow down. It also took a bit of planning and effort to get it to go in the direction I wanted it to go but I didn’t care. This was a thrill. I was so excited that the transmitter I brought up stairs and laid down by our neighbor’s mail box I forgot about. I was lucky it did not rain or have somebody walk off with it. Wait, the best luck was do drive an automotive legend. Enjoy the video.